If a bothy bag isn’t part of your gear kit yet, you should consider adding this ultra-lightweight emergency shelter to it pronto. I’m a huge fan of them and it’s easily one of the top three pieces of gear that I own. 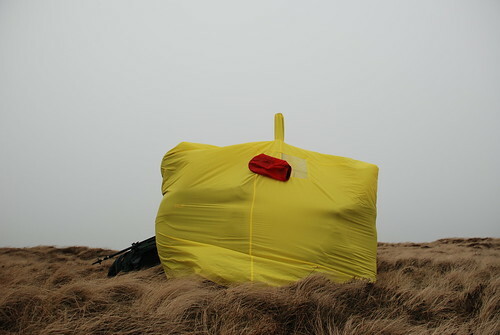 Basically a bothy bag is a nylon sheet cut to easily wrap around you and your friends while you sit on the ground. It cuts the wind and on a cool day warms everybody up with the body heat of the people inside. To demonstrate their effectiveness, the gang from the White Squall Paddling Center put together a quick demonstration of them in action. My guess is that they stayed out for several hours long after the camera operator got cold and went back inside to watch television. There are several manufactures like Terra Nova or Brooks Range Mountaineering who make them in various sizes. You can get them small enough to fit 1-2 people or as many as 12 if you regularly guide or paddler with groups.